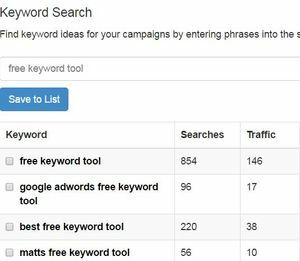 →What Is The Best Free Keyword Tool? Keyword research has become a key factor for the success of any website these days. If you are not able to find good keywords to get ranked on the first pages of Google you will not get organic traffic. A keyword tool can save you a lot of time and hard work. Below you can see what the best free keyword tool is and how to use it. That tool is the Wealthy Affiliate keyword research tool and it is free for all the premium members of WA. However, you can make 30 searches for free if you join as a free member. This free keyword tool and Jaaxy are the two tools that use most of the WA members. Searches: The average monthly searches for the specific keyword you have searched. 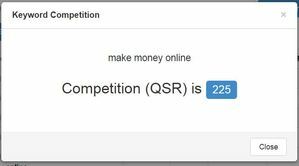 Competition: The number of pages that are competing on the keyword you are looking for. You want the lower possible results. Article Power: It is a ranking system based on the other metrics above. The higher, the better. It is a system that determines how many chances have your post to get ranked. PPC Power: Again the higher is better. It is a system to determine the better keywords for pay per click advertisement. When you want to find a new keyword to target, the two most important metrics are the searches and the competition. 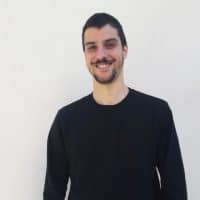 You need enough searches to get some traffic if you get ranked high and you need low competition keywords if you want to have any chances to get ranked. Especially if you have a new website because is more difficult to compete established websites. So, you want to find keywords with at least 50 searches per month and competition under 300. Many people recommend more searches or lower competition. More searches and lower competition would be great and you will learn to find the better possible keywords when you learn how to use it. 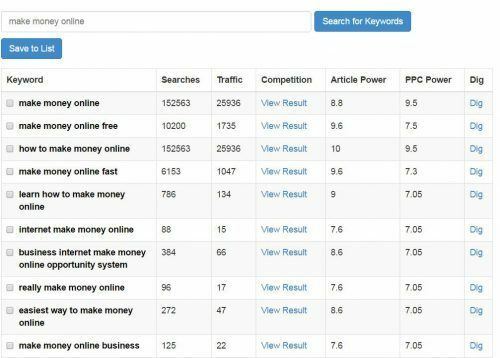 If you have found 2-3 good keywords on the same topic and can not decide what is the best, you can check out the article power too. Create a new account on Wealthy Affiliate. If you do not have a website, check out the WA training until you decide your niche. Then search a keyword for your website. For example, I will search the “make money online” keyword. Check out the photo below. Click the “view result” button to see the competition. Save the keywords that have over 50 searches, lower than 300 competition and make sense. You can see on the right of every keyword the “Dig” button. Click Dig and repeat the process for other keywords too. If you follow the process correctly, after 30 searches you are going to have enough content ideas and keywords to target for your website. The next step is to create posts and pages targeting these keywords. WA training shows you from the first lessons how to target keywords and write quality content. WA keyword tool is a free tool for the premium members of Wealthy Affiliate and the new members have 30 free searches. You can take advantage of the free searches and try it. With your free membership, you have access to the WA training where you can find many guides about this tool. You can join for free here.